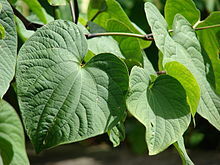 Kava is a plant of the pepper family. It comes from Polynesia and other lands in the Pacific Islands. The roots of the plant are used to make a drink with sedative and anesthetic properties. Kava is used in many cultures in the Pacific Ocean, besides its native Polynesia. These include Hawaii, Vanuatu, Melanesia and some parts of Micronesia. Kava is pain-relieving, calming. and is usually taken as a drug to relax without losing mental clarity in thinking and remembering . Evidence collected in studies show it is likely to be more effective than a placebo at helping calm some mild anxiety. This page was last changed on 10 October 2018, at 11:50.